The subject of August 21, 2017 is prominent Dallas philanthropist and patron of the arts, Margaret McDermott. McDermott was the single largest benefactor and trustee to the Dallas Museum of Art through the Eugene and Margaret McDermott Art Fund in support of the museum's acquisitions program and her donation of over 3,100 works of art to the museum. 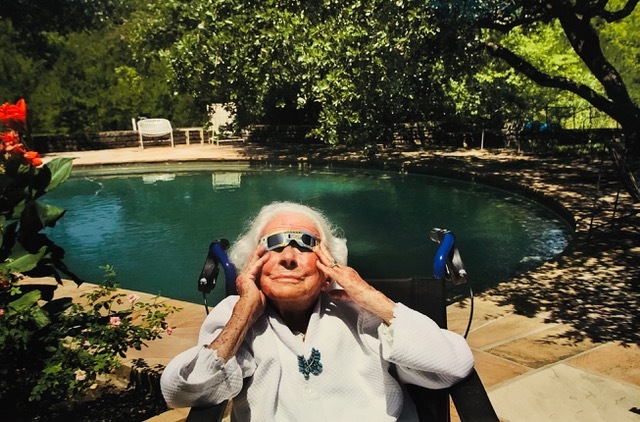 Coulter photographs McDermott in at her ranch in Allen, TX as she looks up at the eclipse on August 21, 2017. This photograph pays tribute to McDermott as an icon of philanthropy and generosity. Nan Coulter (b. 1943) studied photography at Southern Methodist University and has worked as a contributing photojournalist with FD and The Dallas Morning News. Lives in Dallas, Texas.